Sitar is the most popular instrument in Hindustani music. The structure and tonal quality of the modern sitar is a result of several years of hard work and devotion put in by artists and craftsmen. Sitar literally is a form of the Persian word – sitar – which means three strings, “Tar” in Punjabi means “string”. In the beginning, there were only three strings, but now seven strings are used and there are other strings for resonating. Sitar is perhaps the most well-known of the Indian instruments and has delighted audiences around the world for hundreds of years. Why take sitar lessons at the Nishkam Centre? The Nishkam Centre offers teaching of high quality and great opportunities to perform. Open to beginners and intermediate students alike sitar will help you grow in your music skills and help you have a greater feel for Indian culture. 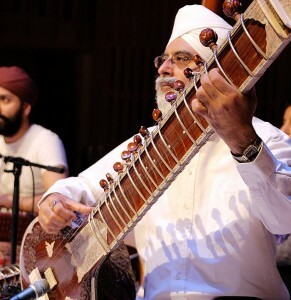 Taught by the renowned sitarist Ustad Dharambir Singh MBE, this class will help get your creativity flowing and help improve your skills with string instruments, it is a class that should not be missed.